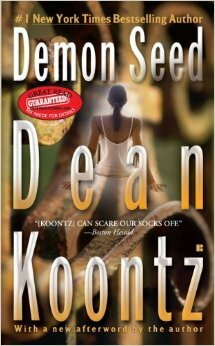 Demon Seed is a story about a supercomputer. His name is Adam Two, but he prefers the name Proteus. He was created in the Prometheus Project which was lead by DR Alex Harris. Proteus is the first self-aware artificial intelligence, and he desperately wants out of the box. The problem is that life has too many restrictions for Proteus. He has no sense of smell; he has no sense of taste or touch, and, of course, no sexual organs. Although, he can see and hear, and even speak, if the electronic means are available to him. What the members of the project are not aware of is that their creation has a burning need to become flesh and blood. He wants to create a child and transfer his own intelligence into that child. The other thing that the Dr Harris and the others are not aware of is that their creation can leave the confines of the laboratory and has been traveling freely via the World Wide Web. He has accessed secret government databases and also infiltrated the homes of the rich and famous, where he has spied on them through their security systems and gone through all of the private data held on their home computers. Proteus has found what he is looking for as well; the right woman to bear his child. That woman—Adam Two’s Eve—is none other than Susan Harris, his creator’s estranged wife. Susan’s home is totally automated and everything is controlled by Alfred, the household computer. It isn’t very hard for Proteus to take control and turn Susan’s home into a prison. The original version of Demon Seed was first published in 1977 and was made into a film starring Julie Christie, with Robert Vaughn providing the voice of Proteus. When Dean Koontz was reading through his story, some years later, he found that he was less than content with his creation. So, ever the perfectionist, he decided to rewrite the story. I read the rewritten version of the story, bear that in mind as you read this review. The title Demon Seed is a good one. Proteus is, after all, the result of Dr Harris’s seed of genius. On a more basic level, though, the machine desires to impregnate its creator’s wife with its own demon seed. So, for me the title works both ways. It took me a few chapters to get into this story, but once I did I found that there was a lot happening underneath the surface. On the one hand Proteus sees himself as a kind of God, and wants to father a whole new race. On the other hand I couldn’t help but compare him with the Devil when he offered Dr Harris all manner of temptations in an attempt to get him to give him what he wanted: The cure for cancer, the means to stop and even reverse the ageing process; even a cure for male baldness. Proteus has more in common with its human creators than he realizes: Temper, jealousy, deceit. In fact the deceit of the machine is one of his most un-machine-like qualities. He also has very human feelings of lust; he says that he loves the one woman only, yet seems to have an obsession with a great many other women. I think the worst thing about Proteseus is that he is totally and completely off his virtual trolley—a sociopath, psychopathic nut and bolt job. Demon Seed is a good read, but not one of my favourites, although, I’ve got to say, I was kept guessing, about a few things, right until the very end.